Notebooking Pages For The Win! You guys, I’m so excited to get to share a this is one of the best things ever product with you! 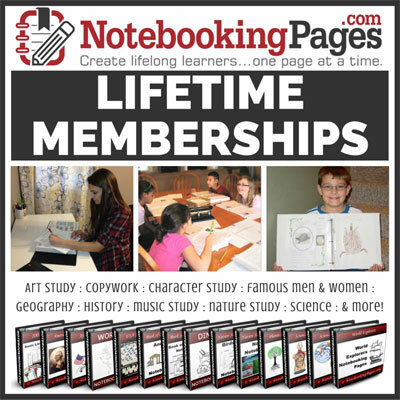 We received a Lifetime Membership to NotebookingPages.com to review, and let me tell you, it is AWESOME! For a long time I’ve been a huge fan of delight directed homeschooling, but sometimes it’s hard to know how to actually make that work. My kids tend to get excited about something for a time and read, write, and do projects related to it. But I’m super disorganized so we didn’t really have a system in place to keep track of their work or prompt additional research or anything, so soon they’d lose interest and we wouldn’t even have anything to show for the work they’d done. 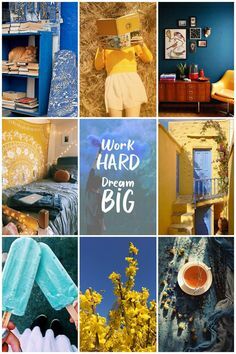 My lifetime membership grants me access to 1000s of printable pages on practically every topic under the sun – and even some about the sun. 😉 I mean seriously they have everything from A-Z animals for littles, to famous composers, and Latin and Greek word studies, as well as a plethora of beautiful copywork pages! 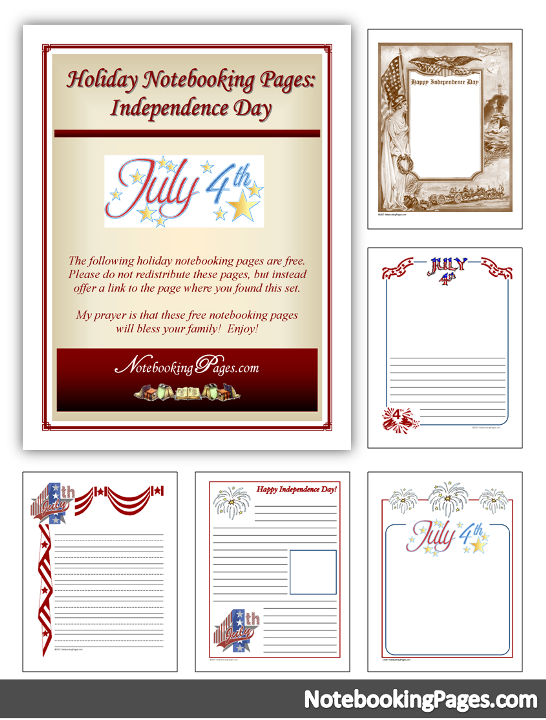 They even have pages for pretty much every holiday, including free Independence Day (USA) Notebooking Pages that you can try if you’re interested! 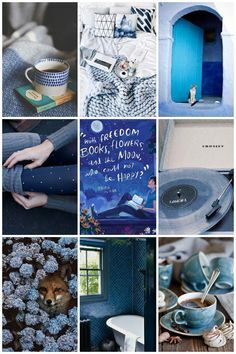 And if we ever come up against a topic we want to work on that they don’t have specific pages for, we can use still use their basic pages with various fun borders, pictures and banners, with lines for writing plus empty boxes for whatever we want to add! Probably my favorite thing about NotebookingPages.com, though, is that it’s actually so much more than just printables…it’s a tool to help my kids organize the research they’re interested in doing and dive deeper, too. For example, the first topic my 9 year old, Artist, wanted me to make a notebook about was wild cats. She’s done lots of research about various wild cats in the past. She loves watching shows about them, and has even written some short-stories featuring wild cats as the main characters. But we’ve never actually though about the work she was doing as an official part of her education, or held onto anything in any sort of meaningful way. So, per her request, I printed out the pages on leopards. She loved carefully coloring the cover page, but she didn’t stop there. Next she had a page prompting her to research and write down the scientific classification, life span, average size, diet, habitat, and so on. Then she had a bunch of pages with pictures to color in, blank boxes to make her own sketches, and plenty of space to write whatever she wanted. She had an awesome time collecting data about lots of different wild cats for her notebook. She even created her own word scramble and she took great care to make sure every page was something she was proud to display, adding special touches like leopard print washi tape. For Boo, who is in kindergarten, there are alphabet copywork pages that look helpful, but we haven’t actually gotten around to them yet because she’s been so excited about pursuing other topics. She first wanted to make a book about her favorite animals. She can’t write yet, so we had to get a bit more creative. She wanted to start with penguins, so she watched a video about penguins while she colored the cover page and then she informed me that penguins eat fish, so we printed out a fish for her to cut out and tape in a blank square on one of the penguin pages. We also printed out a world map so she could color in where they live, and a map of just Antarctica. The best part is how much FUN they both have when they’re notebooking. We took a couple days off school, but they still begged me to print out notebooking pages for them! I love their enthusiasm! I also love the way the pages strike a really awesome balance between prompting them to find out specific information about their chosen topic and giving them space to really make it their own and include whatever they want in their notebook. I suggested we spend a little time on some backyard science and my girls had an awesome time working together to create backyard themed notebooks. Boo decided on a hummingbird for her cover page, and Artist used a dandelion. They used binoculars to bird watch, and a little portable microscope to look at the details of grass and flowers. We printed out pages about the parts of a flower, and they even wanted to include some relevant Bible verse cards. When I asked for their thoughts about NotebookingPages.com for my review, they raved about how much they love it and wanted to make sure we weren’t going to stop using it just because the review period was over. They literally squealed with delight when I assured them that I don’t plan to ever stop using the pages! You should also hop over to the Schoolhouse Review Crew link up and check out how other members of the crew are taking advantage of their NotebookingPages.com memberships, and what they think about the product! 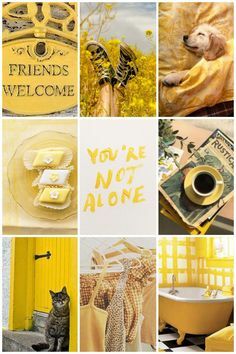 *P.S. This post contains affiliate links, which means that I will get a commission if you decide to purchase anything. 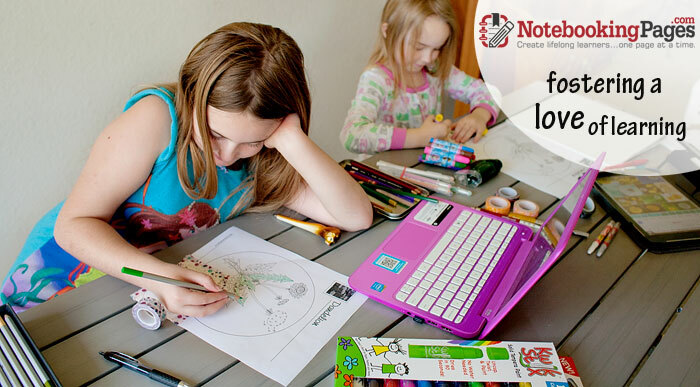 I only signed up for the affiliate program after discovering how much my girls and I love NotebookingPages.com. It’s a product I’m excited to recommend to family and friends, which includes and you guys, too, of course!